PVMBG reported that seismicity at Banda Api had been increasing since the beginning of March, though during 1-4 April seismic patterns were similar to those recorded before an eruption in 1988. The Alert Level was raised to 2 (on a scale of 1-4); visitors and residents were warned not to approach Banda Api within a 1-km radius of the summit area. 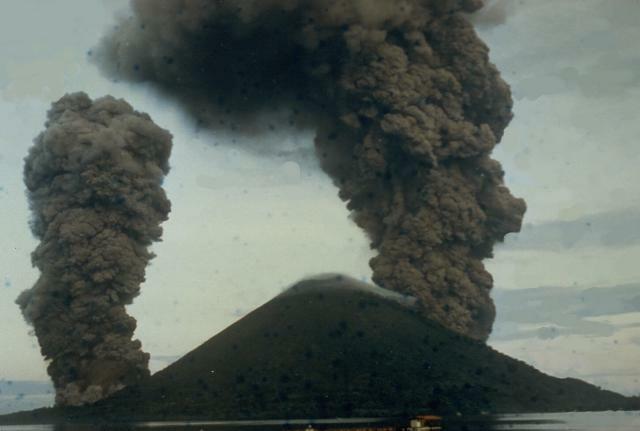 By July 1989, the volcano's activity approached background level. White weak fumes reached 25-35 m above the summit crater and 5-10 m above the N and S craters during the last week in July. Three volcanic A-type, 49 volcanic B-type, one degassing, and 165 tectonic earthquakes were recorded. A M 6.7 tectonic earthquake occurred 150 km SE of Banda Api on 17 June (preliminary epicenter 5.58°S, 130.88°E). Activity consisting of a white plume, reaching 100 m above Banda Api's crater, was reportedly observed after the earthquake. However, photographs taken during a climb to the crater 24-26 April showed no plume or gas emission. On 8 September, eight earthquakes were recorded at the Banda Api observatory post, the first seismic activity there since the 17 June regional earthquake. No change in the activity of the volcano was noted. Banda Api erupted on 9 May at 0630, ejecting a 3-km-high column of gas and tephra that included large incandescent blocks. Explosions continued through 10 May, accompanied by the production of a single lava flow [but see 13:5] that advanced eastward from the summit toward nearby Neira Island. The explosions originated from a line of five craters that probably follow a N-S fissure [but see 13:6] crossing the summit. [The eruption was preceded by several days of increasing seismicity, as follows (date, recorded/felt): 2 May, 11/3; 3 May, 1/0; 4 May, 51/11; 5 May, 110,11; and 6 May, 75/11.] On 8-10 May, earthquakes were felt every few minutes at the village of Neira, ~ 2 km E of the summit. About 1,800 residents of the island have been evacuated to Neira Island and to the larger Lontar Island to the south. More than 5,000 of Neira city's ~ 6,000 inhabitants have also been evacuated to other locations on Neira and to Lontar Island. VSI operates an observation post at Neira city, equipped with a radio and a seismometer. VSI observers left from headquarters for Banda Api on 10 May. Banda Api began to erupt on 9 May at 0630. Two simultaneous eruption columns rose 3-5 km, and three lava flows were extruded. Explosions and lava production continued through the day from craters on the N and S flanks, 1.2 km apart. The activity was more explosive on the S flank than on the N flank. At about 1130, the vertical eruption column from the S vent was briefly deflected to the S, thereby blasting or spraying tephra over a wide area of the western tip of Lontar Island (<1 km from the S end of Gunung Api Island). 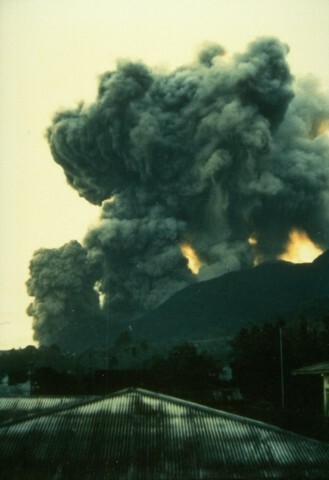 The duration of the directed blast was less than a minute, and eyewitnesses report that "the entire eruption column bent sideways to the S." This deflection was probably caused by slope failure above the vent. Material slumped into the vent and temporarily deflected the eruption column to the S.
A small volume of lava was erupted on the SSW flank at Pintu Kecil (mainly from a vent at 150-200 m elevation) and entered the sea along the S coast. About 50 m E of this flow, a small fissure opened at the coastline and produced a phreatomagmatic deposit of several hundred cubic meters. This deposit was being rapidly eroded when examined on 17 May. Two large lava flows emerged from two fissure craters ~ 400 m apart on the N and NW flanks (at Batu Angus and Pasir Besar). The lower crater was at ~ 150 m elevation, and the upper crater at ~ 200-250 m elevation. The flow at Batu Angus had entered the sea by 1100 on 9 May and continued through 15 May, although most of the volume had already entered by 10 May. The Pasir Besar flow reached the sea on 9 May. A graben developed between the two N-flank vents, causing the two craters to coalesce, probably by late in the day on 9 May. At 2300 on 9 May, activity at the S crater died, and several hours later activity at the N crater also declined. On 10 May, the principal activity was from the summit crater, with minor lava outflow continuing from the N crater. Explosions continued from the summit crater 10-15 May but at gradually diminishing levels of activity. By 16 May, lava on the N side (Batu Angus) had ceased flowing, although occasional phreatic explosions were occurring where lava had covered the littoral zone and entered the sea. All craters were quiet by 18 May. The first few minutes of the eruption produced a pumice lapilli of light gray to beige color with prominent dark euhedral phenocrysts of pyroxene. Material erupted later in the day was more scoriaceous and darker in color. Samples of the three 9 May lava flows are similar in hand specimen; dark gray to greasy black plagioclase pyroxene (hypersthene?) phyric lavas. No olivine has been positively identified in hand specimen. Through 27 May, > 7,000 inhabitants from Gunung Api, Neira, and Lontar Islands have been evacuated to Ambon Island, 200 km NW of Banda Api. Three people were killed during the eruption, two in a boat mishap while evacuating the island. The violent ash explosions and vigorous lava production that began 9 May had subsided by mid-May (13:05). Activity had been concentrated at two vents on the N flank and at numerous vents on the S flank, along a fissure oriented NNE-SSW. Most of the 9.4 x 106 m3 of lava was produced during the first 12-18 hours of the 9-15 May eruption. The flows in order of decreasing volume are: NW flank (Pasir Besar), N flank (Batu Angus), and the two S-flank flows. A persistent white steam plume rose 50 m above the summit vent during June. Approximately eight A-type and eight B-type earthquakes were recorded daily. VSI installed three additional seismometers, including two on Gunung Api. Through May, a total of 7,000 residents had remained evacuated. On 13 June, VSI reassessed the volcanic activity and recommended that residents return to neighboring Banda Neira and Lontar islands. The 1,800 residents of Pulau Gunung Api remained evacuated to Ambon, Ceram, and Lontar Islands. Further Reference. Casadevall, T., Pardyanto, L., Abas, H., and Tulus, 1989, The 1988 eruption of Banda Api volcano, Maluku, Indonesia: Geologi Indonesia, v. 12, n. 1, p. 603-635. Analysis of imagery from Japan's GMS satellite suggested that the eruption clouds reached much higher altitudes than indicated by ground observations. Coldest surface temperatures of eruption clouds measured by the JMA were -78, -79, and -67°C on 29 May at 0700, 0800, and 1100 respectively, corresponding to altitudes of 16-16.5 km above sea level (figure 06ban01f). Aerosol layers were detected at similar altitudes 1-2 months later by lidar in Hawaii and Japan. At Mauna Loa, Hawaii, very small fresh-looking layers were centered at 15.9 and 17.7 km altitude (just above the tropopause) in June, and a thin layer was evident over Fukuoka, Japan at 15.4 km, about 1 km below the tropopause, in early July (see Atmospheric Effects in SEAN 13:06). Figure 1. Temperature gradients in the eruption cloud from Banda Api (solid triangle) measured from GMS infrared images returned on 29 May at 0700, 0800, and 1100. Courtesy of Y. Sawada. Activity at Banda Api declined toward more normal inter-eruptive levels during August. Low-pressure fumes reached 25-50 m above the summit. A daily average of three tectonic and three volcanic events were recorded by seismographs. Information Contacts: Y. Sawada, JMA; VSI. 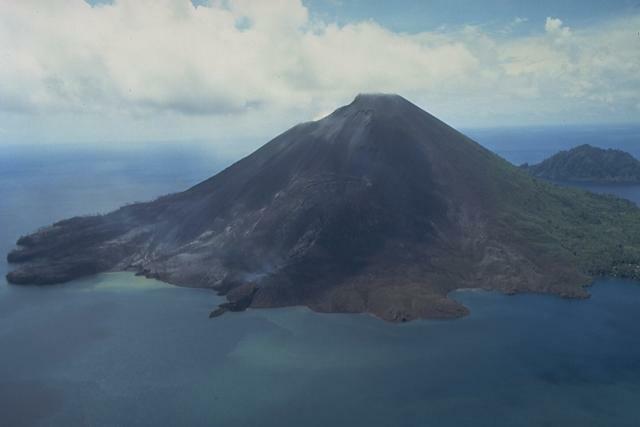 The small island volcano of Banda Api is the NE-most volcano in the Sunda-Banda arc and has a long period of historical observation because of its key location in the Portuguese and Dutch spice trade. 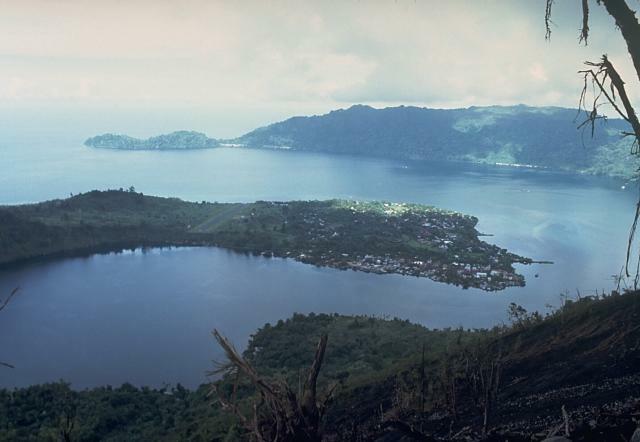 The basaltic-to-rhyodacitic volcano is located in the SW corner of a 7-km-wide mostly submerged caldera that comprises the northernmost of a chain of volcanic islands in the Banda Sea. 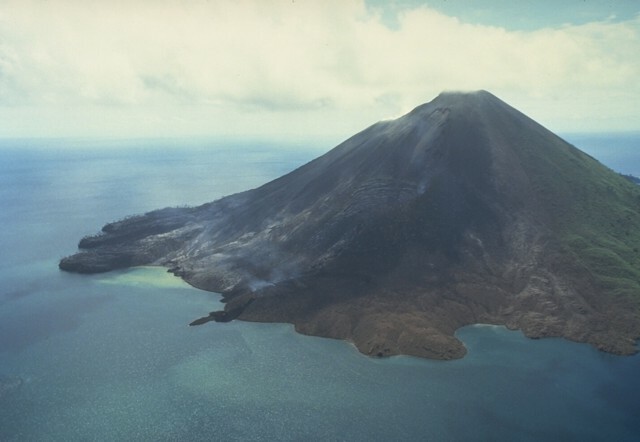 At least two episodes of caldera formation are thought to have occurred, with the arcuate islands of Lonthor and Neira considered to be remnants of the pre-caldera volcanoes. 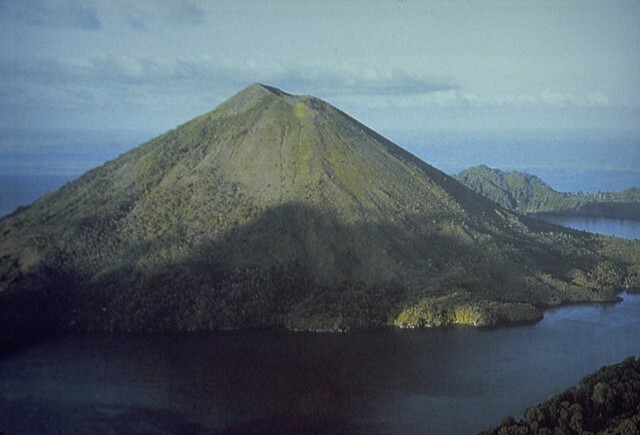 A conical peak rises to about 600 m at the center of the 3-km-wide Banda Api island. Historical eruptions have been recorded since 1586, mostly consisting of Strombolian eruptions from the summit crater, but larger explosive eruptions have occurred and occasional lava flows have reached the coast. Casadevall T J, Pardyanto L, Abas H, Tulus, 1989. 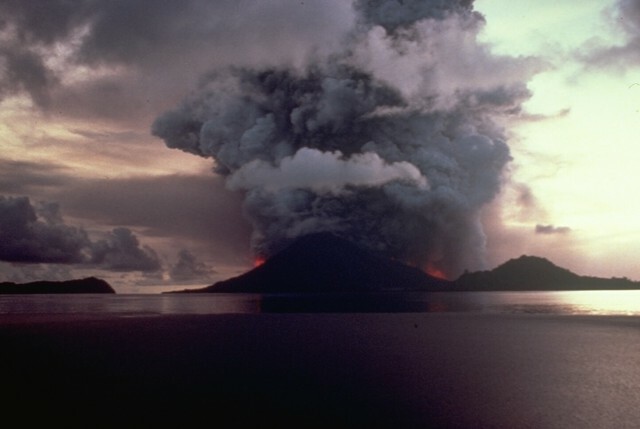 The 1988 eruption of Banda Api volcano, Maluku, Indonesia. Geol Indonesia, 12: 603-635. There is no Deformation History data available for Banda Api. Gunung Api volcano is seen here in an aerial view from the south on May 19, 1988. The narrow peninsula at the left-center is the terminous of a still-steaming lava flow that was erupted from a vent low on the SW flank beginning on May 9. Another flow erupted from a vent at about 150 m elevation on the SW flank also reached the sea immediately to the west. The May 9 vents were located along an arcuate N-SSW-trending fissure that cut across the summit of the volcano. Photo by Tom Casadevall, 1988 (U.S. Geological Survey). This dramatic photo taken from the SE on May 9, 1988, shows ash-rich eruption plumes rising from vents on the north and south sides of the island. The blue dots are a result of film damage. The eruption occurred from a 3-km-long arcuate fissure that cut the island from the south coast to the 200-m elevation on the north flank. The eruption plume reached a maximum height of 16.5 km. Lava flows reached the north, NW, and south coasts, destroying two villages. Photo by I. Yoshida, 1988 (courtesy of Volcanological Survey of Indonesia). A small lava flow from a vent low on the south flank of Gunung Api flowed into the sea, forming a narrow peninsula. 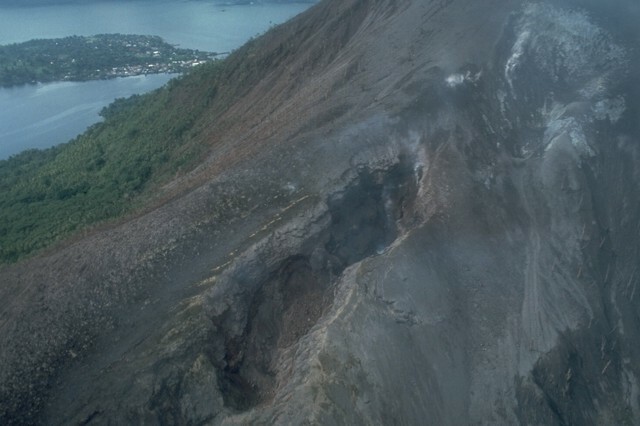 The May 9, 1988 lava flow was erupted from a 100-m-long fissure that produced a tuff cone over the vent. Minor submarine activity occurred at the lower end of the fissure. The western tip of Bantur Island appears in the background. 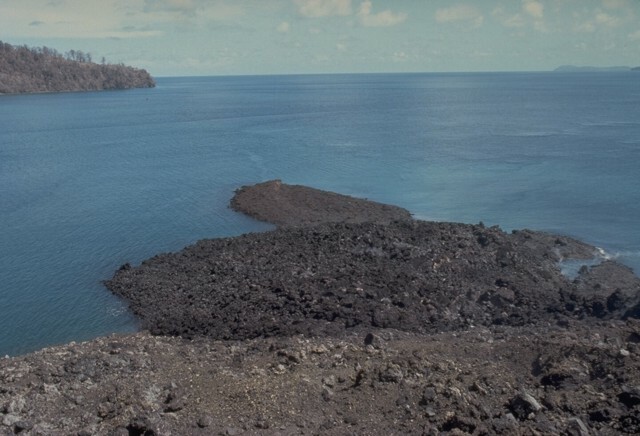 The May 1988 north-flank lava flows reached the sea at two locations. The flows originated from a fissure that can be seen descending diagonally to the left from the summit. The Pasir Besar lava flow was erupted from a vent at about 300-350 m elevation and reached the sea along almost the full length of Pasir Besar bay at the right-center. The Batu Angus lava flow originated from a vent at 200 m elevation and reached the sea at the left-center after overrunning houses in the villages of Kalobi and Batu Angus. 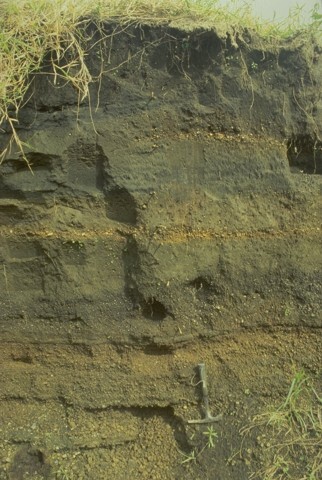 A 2.6-m-thick section at the airport on Neira Island (4.5 km from Banda Api volcano) shows 14 different tephra layers. The uppermost layer originated during an eruption in 1820, when the village was evacuated due to heavy ashfall. The section shows several layers of coarser, lighter-colored pumice and lapilli produced during more vigorous plinian eruptions than occurred in 1988. 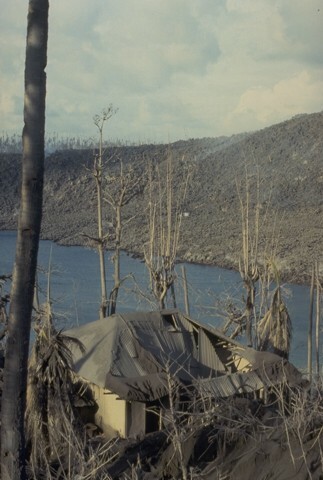 The roof of this house at Pasir Besar on the NW coast of Gunung Api Island collapsed as a result of the loading of ash and the impact of ballistic bombs from the May 9, 1988 eruption of Banda Api volcano. Tephra from the eruption was distributed primarily to the west. The barren slope in the background of this May 19 photo is the surface of the 1988 Pasir Besar lava flow, which descended to the sea from a vent on the northern flank. 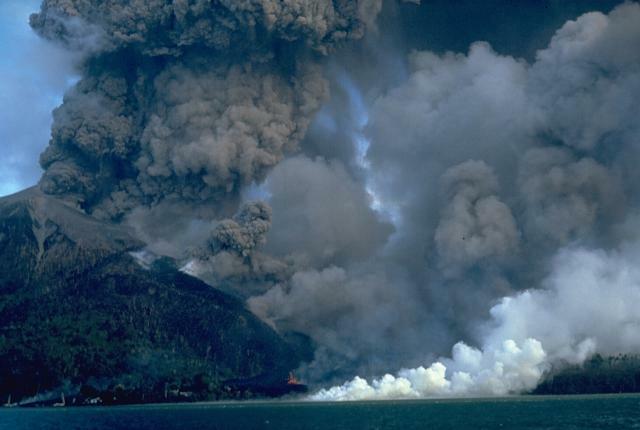 Vigorous explosive eruptions continue from Banda Api volcano at dusk on May 9, 1988. Incandescent lava fountains rise above vents on the northern and southern flanks and the eruption column reaches a height of about 5 km. Activity began at about 6:30 that morning from an eruptive fissure that cut across the volcano. Neira Island is at the right and the western tip of Lonthur Island at the left in this view from the ENE. Photo by Shoji and Taeko Ozawa, 1988, courtesy Tom Casadevall (U.S. Geological Survey). Banda Api volcano is seen here from the SW prior to a major eruption in 1988. The ridge in the right background is Neira Island; at the bottom right is the western tip of Lonthur Island. Both islands are remnants of calderas inside which the conical Gunung Api stratovolcano was constructed. One of many peaks named Gunung Api ("Fire Mountain") in Indonesia, Banda Api is the most active volcano of the Banda arc. Photo courtesy Tom Casadevall (U.S. Geological Survey). 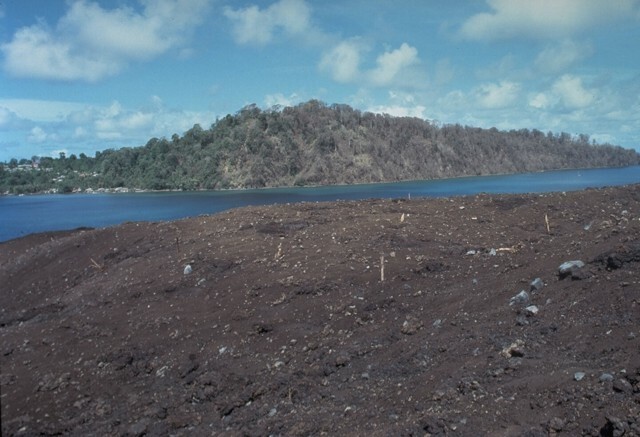 Vegetation in the foreground and on the western tip of Lonthur Island in the background was destroyed and scorched by a directed blast produced by temporary deflection of the vertical plinian eruption column on May 9, 1988. Witnesses reported that at 11:30 am "the entire eruption column bent sidways towards the south," probably as a result of slumping of the uphill slope onto the vent. About 2 cm of tephra was deposited on Lonthur Island, but the village of Lonthur (left) was spared. The 640-m-high symmetrical volcano of Banda Api, the most active of a chain of volcanoes in Indonesia's Banda Sea, forms a small 3-km-wide island within a largely submerged 7-km-wide caldera. This May 19, 1988, view from the south shows vegetation damage from the 1988 eruption and the southern half of a prominent arcuate fissure that extended from the south coast through the summit to 200 m above the north coast. The still-steaming narrow black lava flow entering the sea to the left of center is one of four erupted in 1988. 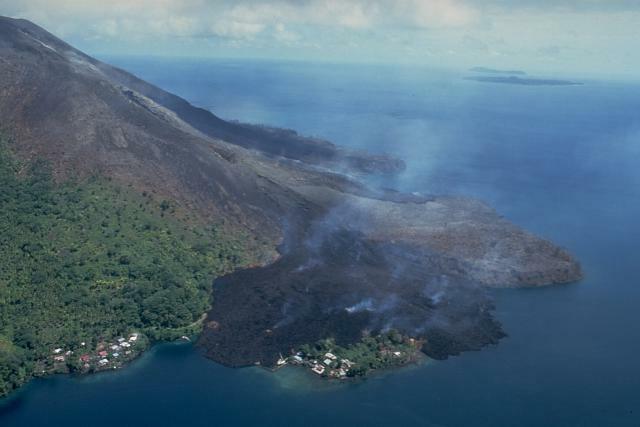 Residents of Neira moved to the west side of the island on 9 May 1988, at the onset of the eruption of Banda Api, and began evacuating. Residents of nearby Gunung Api Island, where the eruption occurred, had been evacuated the previous two days. As many as 10,000 people were evacuated during the eruption; the only people to lose their lives were four who disregarded evacuation orders. 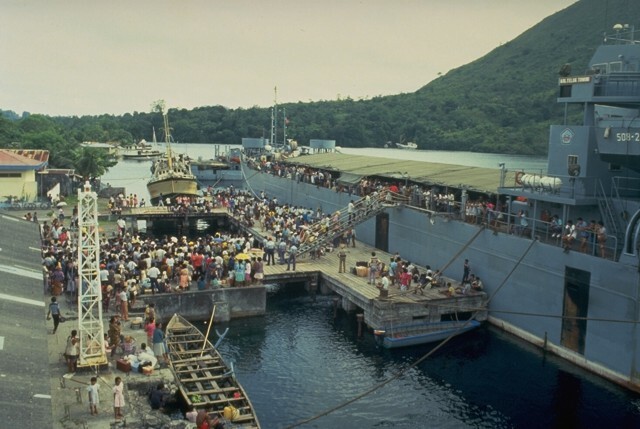 Evacuees on the island of Neira board an Indonesian Navy ship on 20 May 1988, bound for the island of Sulawesi. 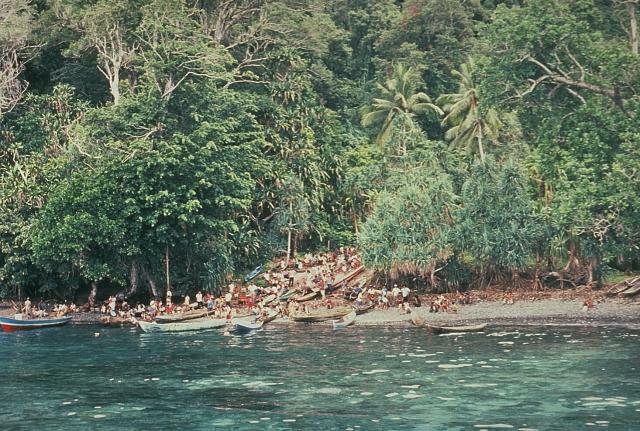 About 10,000 people of a population of 16,000 living in the Banda Islands were evacuated during the 1988 eruption. 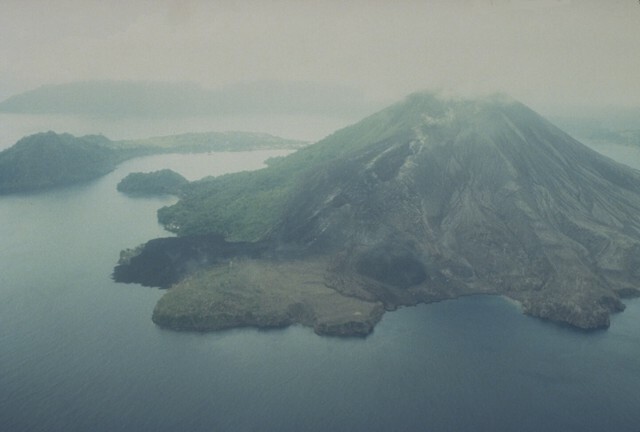 During the two days prior to the start of the eruption on the morning of 9 May, about 1800 people on Gunung Api Island (the site of the eruption) evacuated to Neira and Lonthor Islands. On the 9th, people began moving from Neira Island to Lonthur and then to more distant locations. The evacuation remained in effect until 13 June. A vigorous plinian eruption column, seen from the ENE side during the afternoon of May 9, rises above an arcuate fissure cutting both sides of Banda Api volcano. The plume reached a maximum height of 16.5 km, depositing blocks, pumice, and scoria primarily to the west. Photo by Shoji and Taeko Ozawa, 1988; courtesy of Tom Casadevall (U.S. Geological Survey). 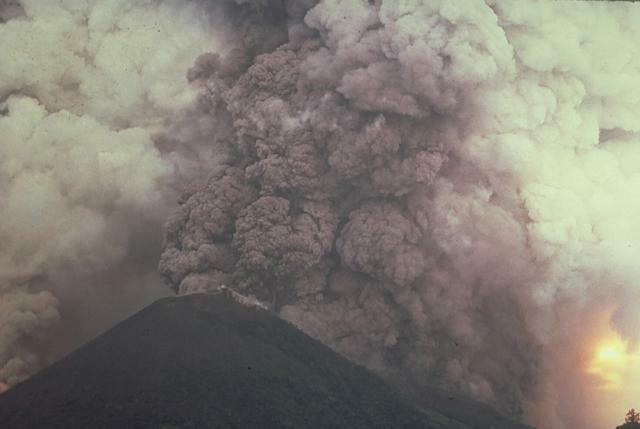 An eruption of Indonesia's Banda Api volcano, seen here on May 10, 1988, took place from a N-SSW-trending fissure that cut across the island. Both explosive activity and lava effusion occurred along the fissure. Billowing, ash-rich eruption plumes rise from vents along the north-side fissure. Minor orange-colored lava fountaining can be seen here at the lower-center, near the north coast. White steam marks the entry of the Batu Angus lava flow into the sea after overrunning two villages. Fissures of vents no. 1 (bottom) and 3 (upper right) cut the northern flank of Banda Api volcano. Ash mantles vegetation adjacent to the fissures, which are about 15-20 m wide at this location. These vents, which began erupting on May 9, 1988, also fed two large lava flows that reached the sea along the northern and NW coasts. Neira Island appears in the background in this May 21, 1988 photo. This May 19, 1988, view from the NE shows a still-steaming black lava flow entering the sea along the north coast, partially overrunning the village of Batu Angus. The lava flow originated from a vent at 200 m on the north flank on May 9, and reached the sea the same day. A second steaming lava flow, the Pasir Besar flow, which originated from a vent at 300-350 m elevation, can be seen reaching the NW coast at the center of the photo. The portion of Batu Angus village surrounded by the lava flow sits on an earlier lava flow erupted in 1901. On May 9, 1988, ash columns rise from four eruptive vents along a fissure on the southern flank of Banda Api volcano, observed here from the village of Neira, located across a narrow strait 4.5 km east of the eruptive fissure. An arcuate N-SSW-trending eruptive fissure cut almost entirely across Gunung Api Island during the first day of the eruption and produced both vigorous explosive activity and lava flows. Winds distributed ashfall primarily to west, away from Neira Island. There are no samples for Banda Api in the Smithsonian's NMNH Department of Mineral Sciences Rock and Ore collection. Large Eruptions of Banda Api Information about large Quaternary eruptions (VEI >= 4) is cataloged in the Large Magnitude Explosive Volcanic Eruptions (LaMEVE) database of the Volcano Global Risk Identification and Analysis Project (VOGRIPA).